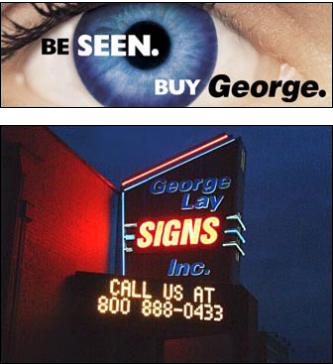 For fifty years, George Lay Signs has provided quality electric signs and billboards to local, regional, and national companies. Signs enlighten, educate and inform us every day, delivering messages efficiently and effectively to entire markets. George Lay Signs offers billboard advertising in the Wichita metropolitan area, and over 350 sites in central and eastern Kansas towns. Sizes range from 6’ x 10’ in rural sites through 14’x48’ lighted bulletins in Wichita. From signs at your business to reaching thousands daily with your ad message on our billboards, George Lay Signs is ready to meet your signage and advertising needs.